My husband has a thing for mountains. Every time we drive over north-east Victoria’s Tawonga Gap, between Bright and Tawonga, he pulls in to the lookout at the top of the pass to pay homage (his words, not mine) to the ‘Big Fella’, Mount Bogong (roughly translated, ‘bogong’ is the Aboriginal word for ‘big fella’). Don’t get me wrong; I like mountains, too. And there's something extra special about a sunny bluebird day in the mountains in the middle of winter. That’s exactly what greeted us the weekend we visited Porepunkah, at the base of Mount Buffalo in Victoria’s High Country, with Mars Campers new Mars Spirit camper trailer in tow. When we rocked up to the Mars factory in Springvale, Melbourne, to pick up the Spirit with our Isuzu MU-X tow tug, I was shocked, in a good way, to see just how beefy and offroad-ready it looked. I’ve seen Spirits before and, if first impressions are anything to go by, this was looking like a good value camper trailer that was going to pack a punch! Seeing it sitting there in all its glory made me wish we had something a little gnarlier planned than a relaxing weekend in a riverside caravan park. But with foreboding weather threatening to ruin our plans, we couldn’t risk a true offroad camping experience in the notoriously changeable alpine environment. We hitched up and hit the Hume with the Mars Campers Spirit secured behind the MU-X with its 2t polyblock coupling. Nothing phased the combo at highway speeds – nor did we expect it to. 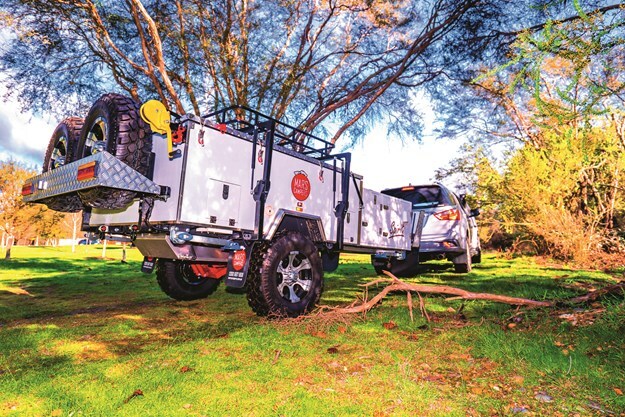 The MU-X’s 3000kg towing capacity wasn’t even slightly rattled by the 1550kg Tare Spirit. Even if it was fully loaded to its ATM of 2000kg, the Spirit wouldn’t have troubled the gutsy tow tug. Offroad towing is obviously a different proposition and, unfortunately, we weren’t in a position to put it properly to the test. But with its high-riding stature, excellent ground clearance, tall rear departure angle, twin rated rear recovery points, and coil sprung independent suspension, the Spirit certainly talks the talk. Sometimes, the apparent ground clearance of offroad trailers lures me in, only for me to discover, when I crawl underneath the chassis, that it’s all for nothing, due to low-hanging pipes or leaf springs which will snag much more quickly. But the Spirit gets the all clear underneath! The pipes are strapped well up out of the way, the sheet-protected water tanks ride high underneath and there was nothing else, that I could see, to cause any dramas. Happily, the drizzly Melbourne weather steadily improved the further away we drove and, by the time we rolled into Porepunkah in the early afternoon, it was practically Spring! 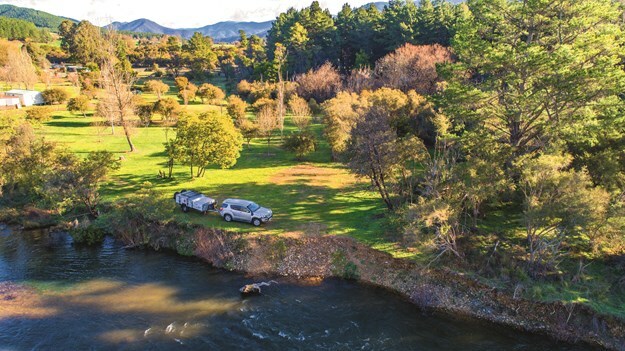 Our destination was the Porepunkah Bridge Holiday Park, which sits right on the lovely Ovens River, just across from town. Porepunkah is charming, just 6km from Bright on the Great Alpine Road and is the gateway to the beautiful Buckland Valley. There are a couple of excellent cafes, several great caravan parks, and the infamously good Punkah Pub. The town hasn’t seen quite the level of gentrification of nearby Bright, but it’s certainly got a lot more energy and vibrancy than in days gone by. At the park, we met our friends (and newlyweds!) Anna and Dima, who had booked into the park’s first luxury glamping tent for the weekend. The tent looked amazing – decked out with cushions, rugs, fairy lights and, most importantly, a heater (the days might have been beautiful but the nights were still icy), but I couldn’t wait to set up camp and make myself at home in the Spirit. Please note, the area shown in these photos is not an official camping area. In terms of setup, the Mars Spirit is typical of a forward-fold camper. The first move is to unclip and swing over the roof/boat rack. This doesn’t have to be used specifically for a boat, if that’s not your bag – it’s equally useful for bikes, a kayak, firewood or just extra camping gear. I’ve always thought the way these racks hang off the side of the camper at an angle is strange, but the struts hold it firmly in place. Then it’s time to attach the front winch to the rear of the camper’s hard top and push it over. You can do this largely by hand but the winch helps in the final part of the descent, with an auto-brake, and holds it in place once down (a rear winch helps with the pack-up procedure). This forward folding portion becomes the main bed, while the trailer’s box contains the dinette (which can convert into a second bed). After that, it’s just a matter of winding down the corner stabilisers, connecting the tent poles to set up the main tent and arranging the cushions for the dinette or second bed, whichever is required. One person can manage the process, although it is significantly easier and quicker with with two. Forward-fold campers aren’t known for their internal space and the Spirit is no exception. However, Mars does supply a fully-walled, 5 x 2.5m annexe which increases your living space substantially. However, as it was just the two of us (and the dog) on this trip, we saved ourselves time by going without. The basic setup can be completed in about five minutes (with two people), but you’re looking at around 20 minutes to set up the full annexe. With that done, it was time to unpack the pantry and enjoy a drink at dusk beside the river. Red wine was our tipple of choice for the season. However, the Spirit comes with a huge, fully lined, external fridge slide to hold your portable fridge and keep your drinks (and food) cold in warmer weather. Then it’s just a step or two over to the large, stainless steel, slide-out kitchen towards the rear of the camper to prep your meal. With a plumbed sink, flexible worklight, and three-burner Thetford gas cooktop with a windbreak, it’s got basically everything you need. And, if you’re like us, and prefer cooking over a barbie or campfire anyway, then the kitchen is just a bonus! Forward-folds aren’t known for their cavernous internal storage (that’s what soft-floors are for!) but the Spirit has a large drawer just forward of the entry door and a large toolbox on the front which will hold heaps of camping gear. Plus, there is additional storage under the dinette seats. As the hours passed, I admit I was secretly pleased we’d be sleeping well off the cold ground and behind semi-solid walls, rather than in the safari tent – even if the tent had a heater and an electric blanket! The Spirit’s main bed is camper queen size, which is always a little squashy for my 190cm (6ft 3in) husband – but it was cosy, and that’s what you want on a cold winter night! The foam mattress was... sufficient, but I’d definitely be optioning up to an innerspring if the Spirit was going to be a permanent fixture in my carport. Had we had more friends, or nephews, along for the night, we could have made up the second bed out of the club-lounge dinette. Granted, these arrangements don’t make the world’s most comfortable beds, but children are adaptable. As it was just us, we left the dinette made up, which gave us somewhere other than the bed to sit and relax inside. There were a few superficial imperfections and issues I thought could have been improved inside the Spirit, such as a broken zip, and exposed wiring and a few screws but this Spirit was a review demo model and, thus, we were not its first campers! 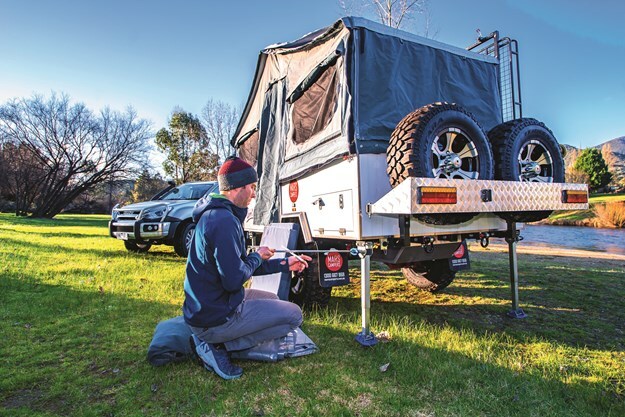 This camper trailer invokes an adventurous spirit and makes you want to get out there into the bush for some offroad action. There’s no doubt it is an impressive package, offering huge bang for buck and offroad ability for what is, essentially, an entry-level price. I would have liked some more time to explore some of the High Country’s iconic offroad tracks with the Spirit in tow - but now I’ve got a good reason to go back. 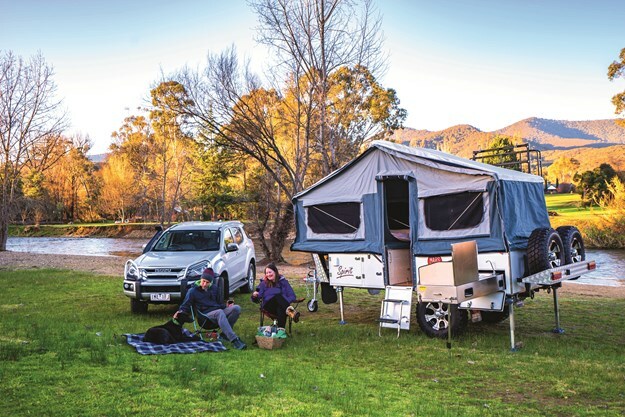 Check out the full review in issue #131 of Camper Trailer Australia magazine. Subscribe today for all the latest camper trailer news, reviews and travel inspiration.